Quantum conductor, insulator; eye injury sensor; 3D printed colloidal crystals. University of Michigan researchers reminded that quantum materials are a type of odd substance that could be many times more efficient at conducting electricity through a mobile device like an iPhone than the commonly used conductor silicon if physicists could figure out how they work. Now, a University of Michigan physicist has taken a step closer by describing what is believed to be a novel quantum material, ytterbium dodecaboride (YbB12), and imaging how efficiently electricity is conducted through this material. The demonstration of this material’s conductivity should contribute to scientists’ understanding of the spin, charge, and energy flow in these electromagnetic materials, they reported. The researchers explained that YbB12 is a very clean crystal that is unusual in that it shares the properties of both conductors and insulators. This means the bulk interior of YbB12 is an insulator and doesn’t conduct electricity, while its surface is extraordinarily efficient at conducting electricity. And the researchers needed to be able to measure exactly how good at conducting electricity this material is. Replacing a phone’s silicon transistors with ones made of quantum materials would make the phone much faster—and much lighter, he asserted, because the transistors inside the device would conduct electricity very quickly on their surfaces, but could be made much smaller, with a lighter core beneath a layer of the metal’s insulating interior. Quantum materials could be used in quantum computing, a field still in its infancy, but which could be used for cybersecurity. Currently, computers work by processing data in binary digits: 0 and 1, but there’s a limit to how fast computers can process data in this way. Instead, quantum computers would use the quantum properties of atoms and electrons to process information, opening up the ability to process huge volumes of information much faster. 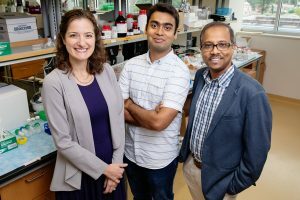 To detect a key marker of eye injury in minutes, which is a a time frame critical to treating eye trauma, University of Illinois researchers developed a gel laden with gold nanoparticles that changes color when it reacts with a teardrop containing ascorbic acid, released from a wound to the eye. Researchers developed a rapid-sensing gel to measure a molecular marker of eye injury in a teardrop. From left: Carle opthamologist Dr. Leanne Labriola, Illinois visiting scholar Ketan Dighe and professor Dipanjan Pan. In a new study, the researchers used the sensor, called OjoGel, to measure ascorbic acid levels in artificial tears and in clinical samples of fluid from patients’ eyes. Study leader Dipanjan Pan, a University of Illinois professor of bioengineering and the Carle Illinois College of Medicine said, “We expect a significant potential impact of this biosensor for evaluating the eye in post-surgical patients as well as trauma patients.” Pan’s group collaborated with Dr. Leanne Labriola, an ophthalmologist at Carle Foundation Hospital in Urbana, to develop OjoGel. “OjoGel technology may allow for faster identification of serious eye injuries. With a rapid point-of-care device such as this, anyone in an emergency department could perform a test and know within minutes if the patient needs urgent surgery to save their vision,” Labriola said. In a technique that could be used to scale-up self-assembled materials for use as optical sensors, color displays, and light-guided electronics, MIT engineers have united the principles of self-assembly and 3D printing using a direct-write colloidal assembly process to build centimeter-high crystals, each made from billions of individual colloids, defined as particles that are between 1 nanometer and 1 micrometer across. 3D-printed colloidal crystals viewed under a light microscope. The team sees the 3D printing technique as a new way to build self-asssembled materials that leverage the novel properties of nanocrystals, at larger scales, such as optical sensors, color displays, and light-guided electronics. “If you could 3D print a circuit that manipulates photons instead of electrons, that could pave the way for future applications in light-based computing, that manipulate light instead of electricity so that devices can be faster and more energy efficient,” Tan said. The team reminded that there are many applications for different kinds of particles ranging from conductive metal particles to semiconducting quantum dots. 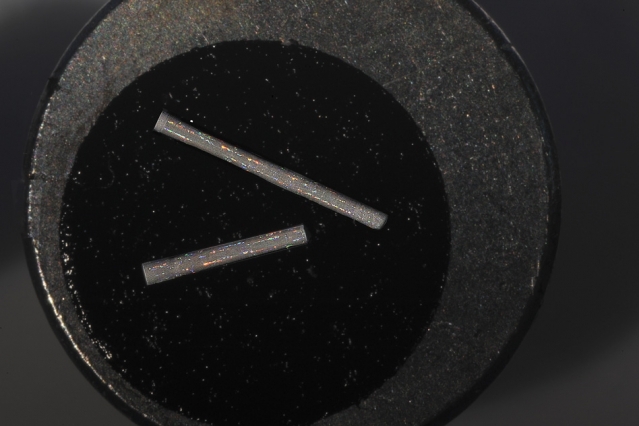 “Combining them into different crystal structures and forming them into different geometries for novel device architectures, I think that would be very effective in fields including sensing, energy storage, and photonics,” Tan added.